Getting people to think is a good thing. However, getting them to think that your ad has a chart that just does not make sense is not a good thing. The more people see this chart, if you can call it a chart, the more they will have questions. Who are these so called 'Other Guys'? Is Google Gmail one of them? Is Hotmail there? What about the great local email provider from my country? These features are not listed in an alphabetic order. Does that mean something? Is Tab View the most important feature? Is it the least important? Do the other features listed on the Y-axis build upon the Tab View? Does it mean that none of the vendors, 'The Other Guys', offer 'Chat', or 'Unlimited Storage'? Their bars do not go up that high. Are these the only features to look for in an online email service? I don't see an entry for 'Calendar'. Surely that's important. , Mobile support, SMS integration, and so on... ? This chart just does not make sense. A shining example of a junk chart. This at least gives a more honest picture of the features that the 'Other Guys' have and don't have. Cartoony charts that serve no other purpose than to convey an illusion of geekiness should be avoided. 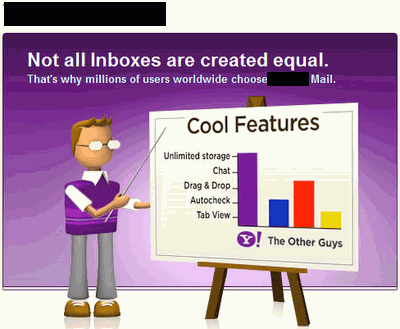 Who anyway compares email providers today? Don't most people today have accounts on two or more of Hotmail, Yahoo Mail, Google Mail, Rediffmail, IndiaTimes mail, AOL, etc... ? In the world of Web 2.0 you create a buzz for your products through netizens, who blog, twitter, digg, and post on Facebook, Orkut, MySpace about your products.